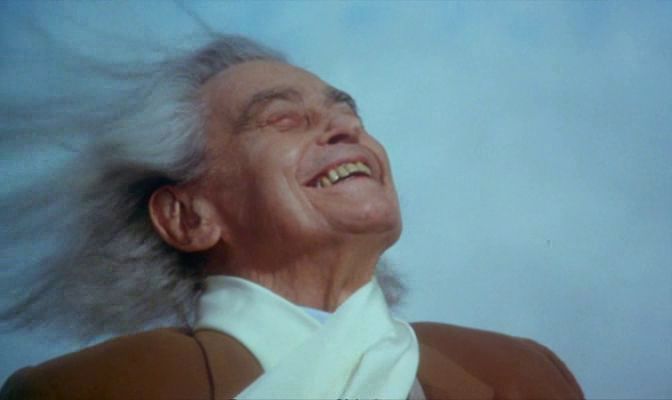 In 1988, at the age of 90, Joris Ivens completed his final film. He had been making movies, many of them documentaries, for a period spanning six decades. Because the films were leftist and often pro-Communist, he was blacklisted from the United States and even for a time in his home country of The Netherlands. In this film, done in collaboration with longtime wife and partner Marceline Loridan (a concentration camp survivor who appeared in Chronicle of a Summer), he travels to China in an attempt to film the wind. Although many of his films (from what I hear, I’ve seen only his lovely abstract short Regen, from 1929) have a political slant, there is nothing didactic or preachy about this one. It’s a combination of documentary and fantasy, a free-associating mix of essay film, tone poem, ethnography and autobiography. It defies classification. Ivens sits in a chair in the middle of the Gobi desert, waiting for the wind. Because he is asthmatic and functioning with only half of one lung, the wind has a physical metaphorical value to him. He seeks a martial arts master to learn the secrets of breathing. There are shots of the wind moving trees and water, shots of windmills. There are shots of rock formations carved by the wind over centuries, juxtaposed with shots of magnificent sculptures carved by human hands. That kind of human creative endeavor plays a part as well, as Ivens incorporates his own work into the film. Standing in front of a giant Buddha with a thousand hands and a thousand eyes, he thinks of the eye of the camera. He trades one of his early films for a mask of the wind. He shows footage from one of his documentaries from the 1930’s, depicting the Japanese invasion of China. He shows himself emerging from the moon of Méliès’s famous short, his own birth as a filmmaker built on those who came before him. He also tries to film the “Terracotta Army” but after eight days of negotiations with authorities, he’s unable to get permission to shoot for more than 10 minutes from dictated spots. So he creates his own terracotta army in a charming bit of tableau vivant. And much of the film is also an observation — without critique or commentary — of Chinese culture. The martial arts demonstration, the repeated appearances of the “Monkey King” figure, numerous references to Chinese mythology and legend, a scene that fancifully recreates a bustling town square. There is a love and appreciation for the culture here, largely divorced from political context. This entry was posted on May 18, 2013 at 3:31 pm	and is filed under Movie Reviews. You can follow any responses to this entry through the RSS 2.0 feed. You can leave a response, or trackback from your own site.